Disclaimer: I’m not going to sit here and act like I’m thrilled about last night’s outcome. The Royals desperately needed the Tigers to complete the 9th inning collapse. It was exciting, but the White Sox couldn’t finish the job. Having said that, let’s see how good of a job I can do reporting on the Tigers and Comerica Park. The Detroit Tigers have been around since 1894 as a part of the Western League. The rest of the teams in that league have either dissolved or moved to another city. The Milwaukee Brewers became the St. Louis Browns became the Baltimore Orioles; the Kansas City Blues became the Washington Senators became the Minnesota Twins; the Grand Rapids Rustlers moved to Cleveland and eventually became the Indians; the Souix City Cornhuskers became the St. Paul Saints became the Chicago White Sox; the rest of the league was dropped in 1901 when the American League was created. 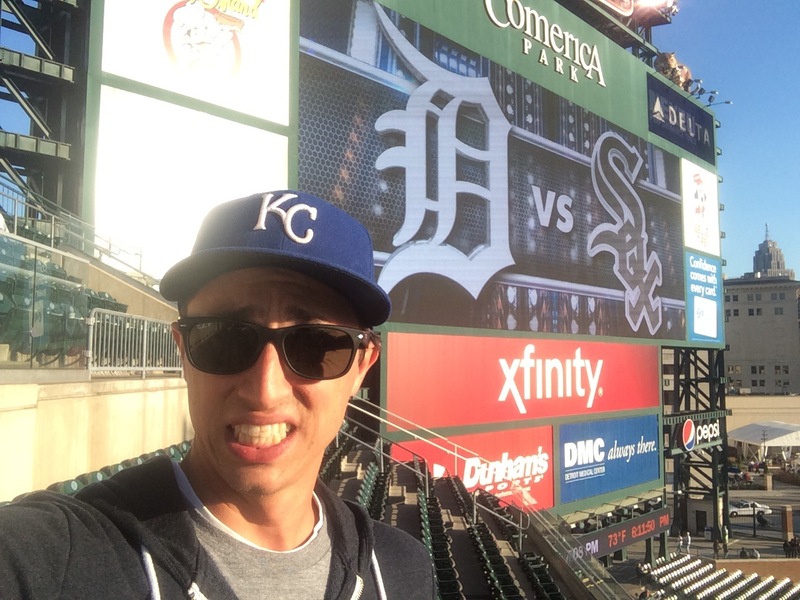 But the Detroit Tigers remain. 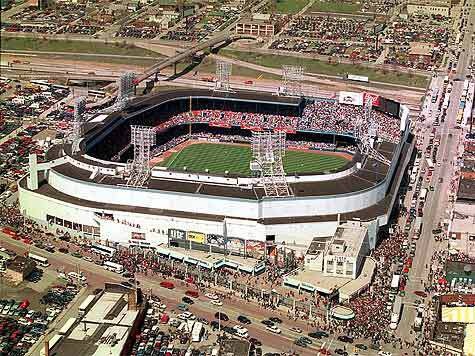 They joined the American League that year, and in 1912, they built their home for the next 87 years: Tiger Stadium. 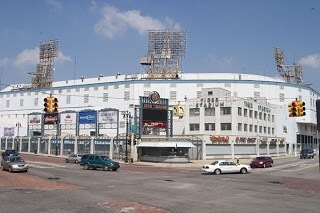 Tiger Stadium was located in the Corktown neighborhood just a couple miles west of downtown, and was demolished in 1999 and replaced by Comerica Park. The demolition of one of baseball’s iconic ballparks was a very sad day for the city of Detroit and baseball fans around the country. Tiger Stadium used to stand with Wrigley Field (1914), Fenway Park (1912), Ebbets Field (1913), Comiskey Park (1910), Shibe Park (1909), Forbes Field (1909) and Griffith Stadium (1911) as parks built during the glory days of ballparks. Obviously Fenway and Wrigley still stand today. Forbes, Griffith, Shibe and Ebbets were done away with decades ago. Comiskey is a heartbreaker because it certainly would still be standing if it had only waited a few more years to see what Baltimore did at Camden Yards. Instead they’re stuck with The Cell – aptly named, really. 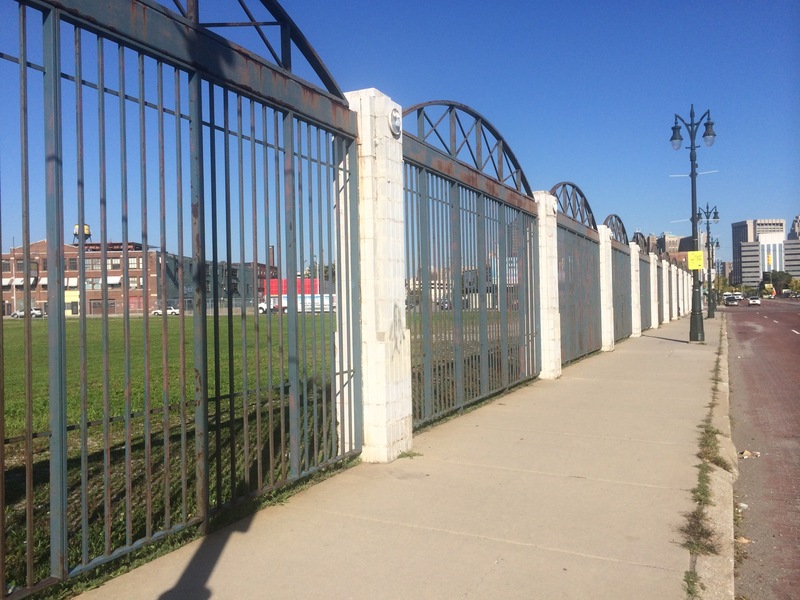 The Tigers were the last of the bunch to tear down their historic park, but they’re the only ones of the demolished group to survive to the retro-ballpark movement. They don’t have any excuses. 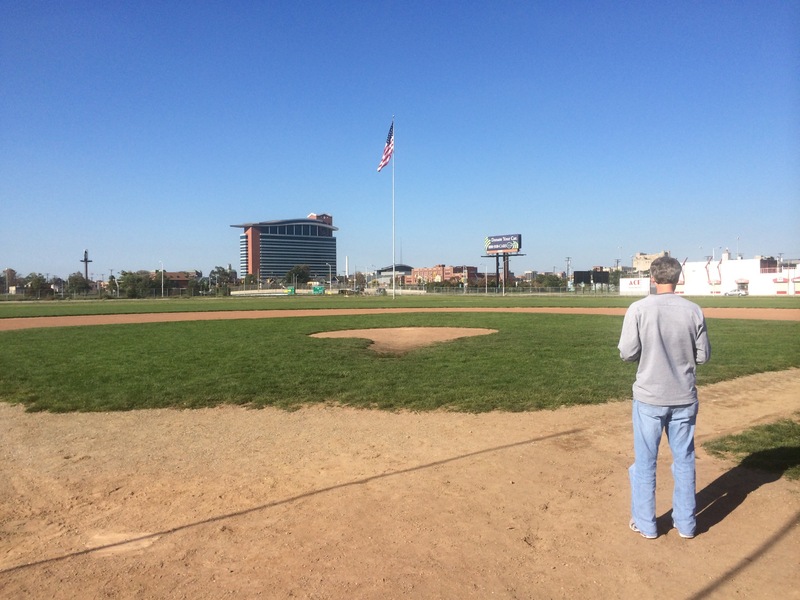 The old park site is still a green field at the corner of Trumbull Street and Michigan Avenue. We* stopped by and walked out on to the old infield. I toed the rubber where Bob Gibson pitched in the World Series of his historic 1968 season when he recorded a 1.12 ERA. He allowed 49 runs all season in over 300 innings. After a dominating Game 1 performance, Gibson lost his next two starts as the Tigers defeated the Cardinals for their third of their four championships. They haven’t won since leaving, despite winning the American League in 2006 and 2012, and the division the last three years (and potentially four if they can hold off the all-but-guaranteed-to-win-it-all Royals). I’m guessing we’ll be talking about some sort of Curse of Tiger Stadium about 50 years from now. Here are a couple shots of what it looks like today. The first and last are what it used to look like. Notice the gate entrances in the old pics and the outfield flag pole. Actually, with the way Detroit is headed, it might be way sooner than 50 years. No city has been hit harder by the down turn in the US economy than Detroit. The population has plummeted in recent years: $1.8M in 1950; $1M by 1990; $900K in 2009…and less than 700K today. Downtown is old and crumbling, the automotive industry is in a tailspin – just this morning an employee at our hotel told me that the Cadillac is separating from GM and leaving Detroit for New York. Another 700 Detroiters out of jobs and likely out of town. Hard times in Motown. At least the baseball team gives them something to cheer about these days. Back-to-back and reigning AL MVP, Miguel Cabrera first and foremost, and a pitching staff featuring three Cy Young winners: Justin Verlander, Max Scherzer and newly acquired David Price. 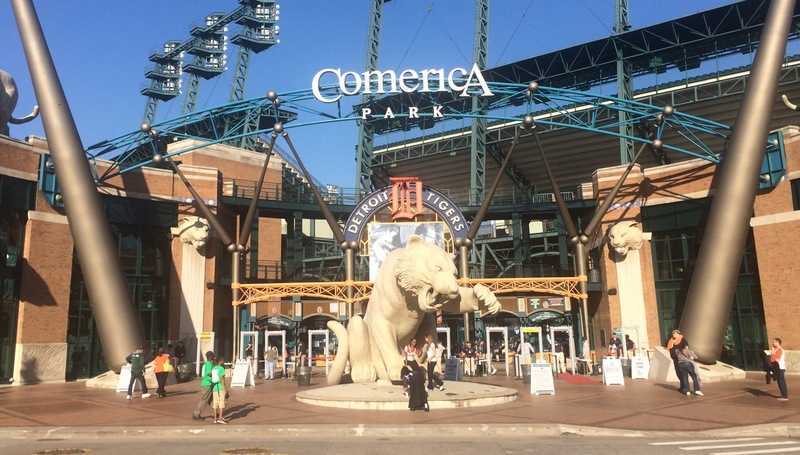 Now, don’t get me wrong, Comerica is a beautiful park with lots of nods to the ballparks of the past. 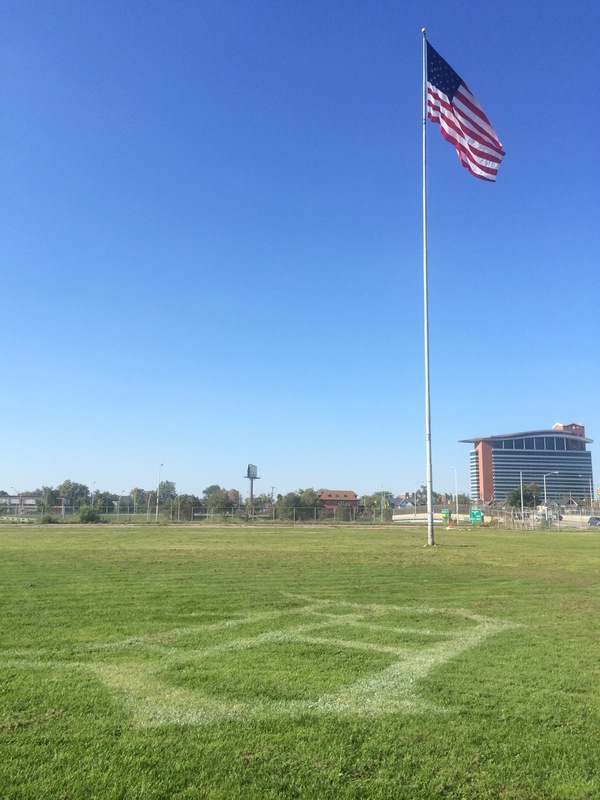 The massive flag pole in center was originally in play when the ballpark was first built, just like Tiger Stadium. Unlike most ballparks, they have a dirt path between home plate and the pitching rubber, a nod to a time when grounds keeping wasn’t as advanced and the amount of travel of pitchers and catchers would wear a track into the grass. The brick beyond the 424′ centerfield wall is a nice touch. It features the names of past Tiger greats such as Ty Cobb, Al Kaline, Hank Greenberg, Willie Horton, Hal Newhouser, and Charlie Gehringer face the field of play. Behind the wall are statues of these same players doing what they did best. 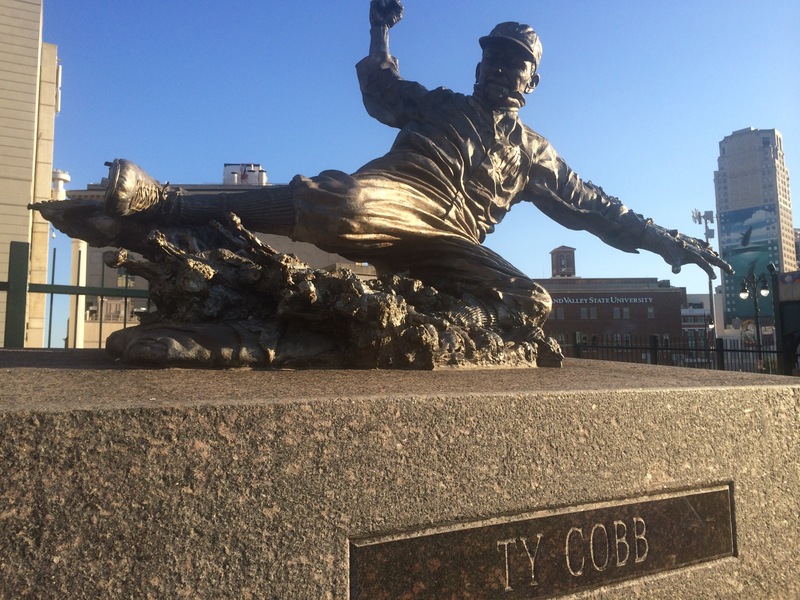 Naturally, Ty Cobb is shown sliding spikes up. In the book, this chapter might end up being about Ty Cobb. We’ll see. The craziest thing that happened at the game last night: two fans in our section got hit in the head by foul balls. One was sitting right next to us in our row. In the second inning, a ball off the bat of Semien popped over our heads just nipping the edge of the upper deck and caroming straight down at us. The guy didn’t take cover in time and it hit him just above the eye, splitting his brow, requiring a few stitches. Then again in the 8th, with Rajai Davis batting, a ball came up over our heads bounced off the face of the third deck and came rocketing back off toward home plate and hit a woman in the same spot as our neighbor. She left with out any blood, but a noticeable black eye. The fans are surprisingly close to the action at baseball games when you think about it, but in all the games I’ve been to in my life, I’ve never seen anything like that. In more positive news, two other foul balls came our way and landed a few rows below us. Two different men caught them and handed it to young boys nearby. Bravo, gents. Well played. I’ve never gotten a foul ball by the way. I’ve been to around 50 ball games this year, and haven’t even been involved in a scrum for one. I’ve had players and coaches toss me a ball, but I’ve never pulled an actual gameplay ball. On to the game notes, because that’s what’s most exciting here. This game was a lot of scoreboard watching, which might explain how multiple people weren’t paying attention and got hit by foul balls. Going into the game, the Tigers sat in first place in the AL Central. One game up on the Royals. A loss would allow the Royals to potentially move into first if they won. They also sat with the same record as the wild card leading Athletics who played later and three games up on the Mariners who are fighting for the last wild card spot. This game was a pitchers duel for the first 6 innings. Scott Carroll battled the Tigers potent lineup through 6 innings giving up the first run of the game off a Davis single to start the 7th, and a throwing error by the catcher as Davis tried to steal third. The Royals, meanwhile, were winning big. The game finished 7-1, but the were up for the majority of the game, so Tigers fans knew this was a necessary win. Things got away from the White Sox when they pulled Carroll after he let the leadoff man on in the 7th. Belisario came in and got the lead runner at second on an attempted sacrifice bunt, but an error by Semien on probably an inning-ending doubleplay groundball to third allowed the inning to continue. The Tigers would score two runs and take a 3-0 lead. But the real drama came in the 9th. David Price had a 4-hit shutout going and Tigers manager, Brad Ausmus, sent him out to complete the game. Adam Eaton singled softly up the middle and the Sox’ rally was on. Ausmus came out to talk to Price. With Joe “Every Save’s an Adventure” Nathan warm in the bullpen, it looked like Price was done and Ramirez-Abreu-Garcia, all righties, would face the righty Nathan instead. Except the fans didn’t want it. The Tigers’ bullpen has been absolutely terrible all season, and the fans wanted Price to get the CG SO. They hollered and yelled and booed at the idea of trusting the anyone in the bullpen with this game, let alone Nathan. This is the same Joe Nathan who flipped of the fans a few months back. There’s some emotional strain in the relationship, it seems. Ausmus, whether influenced by the fans or of his own accord, opted to stick with Price. It was the wrong choice. Price gave up two more runs and the game was tied. Let’s be honest though, Ausmus faced a lose-lose situation. Nathan probably wouldn’t have done any better. Speaks volumes to how little the Tigers think of their miserable bullpen. I mean, there’s nobody out there better than a tired David Price? No one is better fresh than Price is after 8 innings? I really don’t know if there is. Finally, Nathan came in and got Suarez to fly out to center with the bases loaded to end the rally. The White Sox brought in Jake Petricka to face the Tigers in the bottom of the 9th. Due up: Kinsler-Hunter-Cabrera. It wasn’t shocking what happened next. Kinsler singled. Hunter walked. Cabrera singled and Kinsler scored. Game over. The Tigers rely almost exclusively on starting pitching and power hitting to win ballgames, and this game was no different. The Tigers maintained their 1 game lead in the Central. Their magic number is 2 to make the playoffs and 5 clench the Central with 5 games left. Twenty-nine down. One to go. Photo cred for the last two here and here. All others are mine.